^ Iraq War (PDF). U.S. Department of State. [18 November 2012]. ^ Operation Iraqi Freedom. iCasualties. [24 August 2010]. ^ Home and Away: Iraq and Afghanistan War Casualties. CNN. [30 March 2010]. ^ Fact Sheets | Operations Factsheets | Operations in Iraq: British Fatalities. Ministry of Defence of the United Kingdom. [17 October 2009]. （原始内容存档于11 October 2009）. ^ Casualty (PDF). U.S. Department of Defense. [18 November 2012]. ^ 9.0 9.1 Office of Workers' Compensation Programs (OWCP) – Defense Base Act Case Summary by Nation. U.S. Department of Labor. [15 December 2011]. ^ 10.0 10.1 T. Christian Miller. U.S. Government Private Contract Worker Deaths and Injuries. Projects.propublica.org. 23 September 2009 [23 October 2010]. （原始内容存档于2011年7月27日）. ^ 不战而亡——第二次海湾战争中的伊拉克空军. 空军之翼. 2011-05-16 [2011-05-28]. ^ Defector admits to WMD lies that triggered Iraq war. 2011-02-15. ^ 22.0 22.1 Operation Hotel California, The Clandestine War inside Iraq, Mike Tucker and Charles Faddis, 2008. ^ 23.0 23.1 23.2 Plan of Attack, Bob Woodward, 2004. ^ Operation Iraqi Freedom. Target Iraq. GlobalSecurity.org. 2005-04-27. ^ Australian Department of Defence (2004). The War in Iraq. ADF Operations in the Middle East in 2003. Page 11. ^ Surrogate Warfare: The Role of U.S. Army Special Forces - MAJ Isaac J. Peltier, U.S. Army – p. 29. [2009-09-13]. （原始内容存档于2009-02-11）. ^ Zucchino, David. Army Stage-Managed Fall of Hussein Statue. LA Times. 2004-07-03 [2010-10-23]. ^ Iraqi Protesters Burn Bush Effigy. Cbsnews.com. 2008-11-21 [2010-10-23]. ^ Stuff Happens. Defenselink.mil. [2010-10-23]. ^ Reuters. "Getting amputees back on their feet".Washington Post. Oct. 25, 2005. 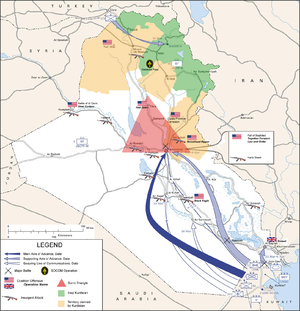 ^ Operation Iraqi Freedom Maps. GlobalSecurity.Org. ^ iCasualties: Iraq Coalition Casualty Count - Deaths by Province Year/Month. Icasualties.org. [2008-10-27]. （原始内容存档于2008年7月8日）. ^ Poll: Iraqis out of patience. USA Today. 2004-04-30. （原始内容存档于2016-04-21）. ^ Reuters. Gloom descends on Iraqi leaders as civil war looms. （原始内容存档于2007-09-30）. ^ Pentagon: Saddam is POW. CNN. 2004-01-10. ^ Saddam 'caught like a rat' in a hole. CNN. 2003-12-15. ^ Blackwater in the Crosshairs: The Families of Four Private Security Contractors Killed in Fallujah File a Ground-Breaking Lawsuit 互联网档案馆的存檔，存档日期2007-11-16. ^ 美军在巴格达举行降旗仪式 标志伊战结束(图). 中国新闻网. 2011-12-15. ^ 美国拟扩编驻伊拉克使馆 安排近万名安保人员. 新京报. 2011-12-20. ^ Ellen Knickmeyer (2005-06-03). "Iraq Puts Civilian Toll at 12,000". The Washington Post. http://www.washingtonpost.com/wp-dyn/content/article/2005/06/02/AR2005060201098.html. 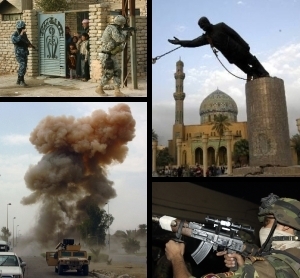 ^ Who are the Iraq Insurgents?". NewsHour with Jim Lehrer. 2006-06-12. ^ Kidnappers Kill Algerian Diplomats". Free Internet Press. 2005-07-27. 存档副本. [2008-10-05]. （原始内容存档于2007-09-27）. .
^ Alex Rodriguez, Iraqi shrine blast suspect caught (paid archive), The Chicago Tribune June 29, 2006. ^ Foreign hostages in Iraq". CBC News. 2006-06-22. http://www.cbc.ca/news/background/iraq/hostages.html#killed. 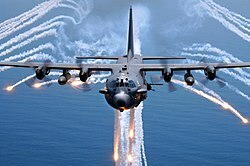 ^ "4 Contractors murdered by al Qaeda". Washingtonpost.com. 2004-03-31. http://www.washingtonpost.com/wp-srv/mmedia/apdaily/033104-11v.htm. Retrieved 2010-10-23.